TORONTO/LOS ANGELES, June 21, 2011 — Synaptop (www.synaptop.com) lets you listen to your music from any internet-enabled device and lets you listen to songs with your friends, live! Synaptop, a website that launched recently, is a virtual online computer that runs on the cloud. On Synaptop, you can store files and run apps, and what’s more, you can follow or be followed by friends in any app! 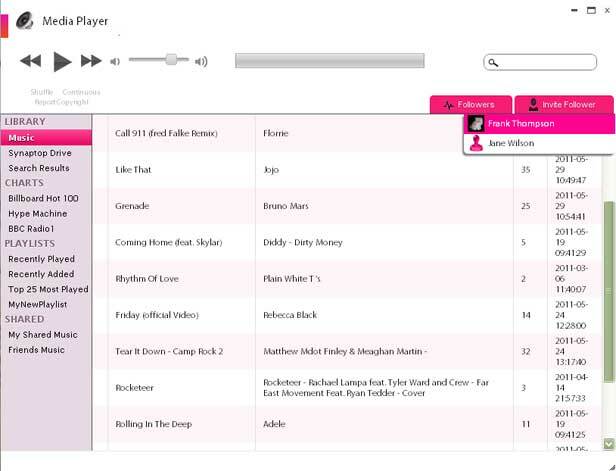 Synaptop’s Free Music Player app is a free app allows you to upload and access your music anywhere through any internet-enabled device. Now you can effortlessly access your music at home, work, school, or on the go. This app provides you with all the conventional media player features such as creating playlists and organizing your music, but what really makes this app a digital triumph is that it allows you and your friends to create your own musical experience. You can listen to songs with your friends, follow your friends’ music, or Co-DJ(TM) with them. You can even video chat or collaborate on other Synaptop apps while listening to songs together through Synaptop’s Media Player. In digital heaven, every music addict is connected to the best songs and tunes regardless of time and place. Here on earth, Synaptop’s Media Player app provides you with the closest thing to unbounded aural pleasure. You can find every song worth listening to on this app. Synaptop’s newly revamped user interface adapts to your device and works on PCs, MACs, Linux devices, iPhones, iPads, playbooks, Android phones, Windows phones, Samsung Galaxy tabs, and other devices. With Synaptop’s Media Player, there’s no manual syncing required. You have seamless access to your music everywhere. The Synaptop Media Player is our tribute to music. Crushing all borders, pushing all the limits, sharing all the love, anytime.